Another ransomware variant encrypts your files unless you subscribe to PewDiePie — but even if you do, it deletes them anyway. Certain members of YouTube star PewDiePie’s fanbase have started infecting people’s computers with homemade ransomware, according to a new investigation by ZDNet, in the ongoing push to get the YouTuber back on top as the channel with the most subscribers in the world. In the past, mischievous PewDiePie fans have hacked publicly-accessible printers and spammed comments online, urging people to subscribe to the online gamer-turned controversial YouTube personality — but an actual virus represents a dangerous escalation in similar tactics. When a computer gets hit by ransomware, it encrypts the hard disk until you meet the hackers’ demands, sort of like a digital hostage situation. Developing ransomware and calling it a prank, as PewDiePie fans have done, is one thing. But the PewDiePie-inspired ransomware is made so poorly, according to ZDNet’s analysis, that it’s doing permanent damage: Because the authors of the first PewDiePie ransomware failed to save encryption keys, even if victims met the demands, their files were lost for good. Another ransomware attack holds computers hostage until PewDiePie reached 100 million subscribers on YouTube — and if his rival channel T-Series did so first, the files would be permanently deleted. The person behind that attack, realizing just how much trouble they could get themselves into after having infected a few computers, publicly released their code so people could decrypt their files and move on. 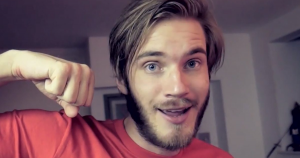 But still, it’s unlikely that PewDiePie’s fans are about to stop their notoriously obnoxious campaign any time soon.